Blue Prism Café turned 12 months old this week. An exciting milestone in our journey to bring you stories on how customers drive scale with Blue Prism RPA. Earlier this week we hosted Lee Coulter, CEO at Ascension Ministry Service Centre and Scott Teeple, Chief Technology Officer at Agilify. 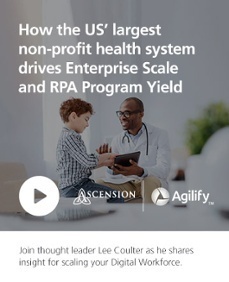 As the largest independent healthcare provider in the US, Ascension has leveraged Blue Prism’s robotic process automation (RPA) platform, as a strategic differentiator within its business, for over 6 years. Lee and Scott discussed the various elements that were critical to Ascension’s success in deploying intelligent automation and key insights on how to build-in scaling capability from the start. Lee currently leads the shared-services operation of the largest non-profit healthcare system in the US, and is driving continuous process improvement through RPA, or as he terms it – ‘Intelligent Process Automation’. He is also Chair of the IEEE’s working standards group on IPA and the current standard under development is the Taxonomy for Intelligent Process Automation Products. Lee was groomed for leadership at GE during Jack Welch’s leadership. He has been an executive leader in five industries, on five continents, running P&L in the front office and transforming the back office. Scott is the Chief Technology Officer and is responsible for the Automation Strategies at Agilify. This is a new business that grew out of Ascension’s Service Center to provide accrued RPA knowledge and Blue Prism-certified process automation training, and consulting to Ascension – as well as external clients seeking business transformation. As one of the continent’s first adopters of Blue Prism’s RPA technology, Ascension has a long track record of delivering RPA solutions that meet the toughest security and compliance requirements. It’s been an exciting journey for Lee and Scott, who have gone from a Blue Prism client – to value-added resale partner and now – via Agilify – an authorized training partner for Ascension’s own associates. With Lee’s enduring automation experience, it was inevitable that Ascension would become an RPA pioneer. As early as 2012, Lee began testing and piloting automation and had 40 machines quietly running Blue Prism bots at Ascension. The value quickly became clear and cynics within the organization were immediately converted when they understood that to match the bots’ work output would have required hiring 60 staff. Lee believes that this proof of concept, then gaining experience and understanding the best practices for bringing automation into an enterprise – was critical in swiftly bringing the overall organization along its automation journey. This included providing a structured and controlled environment for managing demand, delivery and sustainability – while ensuring that only use cases most appropriate for automation were being selected. Ascension’s early use cases focused on talent acquisition and lead management as people needed to get information from one system into another, in a slightly transformed way. Ascension now has over 100 process automation use cases that are far more sophisticated – driven by a combination of RPA and cognitive technologies that can automate more complex tasks – such as analysis of capital expenditure data. Wider areas are being transformed quickly by RPA too, such as customer experience optimization – that’s resulting in a satisfaction increase of 17%. Tasks that humans can’t do are also being addressed – one example is in clinical records management where RPA monitors systems to spot the hallmarks of appropriate or inappropriate behavior. “Use cases save us time and labor and money- but they also change the game strategically, and that’s really making that transition from just automating the things people were doing to using automation to do things that you haven’t yet imagined. It’s about transformation,” says Lee Coulter. Operating with multiple technologies, infrastructure and production management teams Lee wanted to establish the total program yield from all of this work. This insight was deemed important – especially as automation teams become more pervasive, they will increasingly have to demonstrate a net benefit to the enterprise. To ensure RPA’s value was understood an overall programme yield was measured – from the start – through to the endpoint, and the net benefits revealed a compelling 10 percent year-over-year cost reduction – over 5 years. Agilify, the newly launched automation services business, was formed in 2017 when it became clear that the experience its founders had gained from building an Automation Practice from the ground up – had real value, not just for Ascension – but others too. Lee believes they now have some of the deepest technical capabilities across multiple technologies and can show how to embrace enterprise adoption. Blue Prism-certified training and consulting also addresses strategy, risk and control, business analysis, change management, and operations resilience. Ascension wanted to establish how well its automation program was running, as they understood that it inevitably touches compliance or regulatory processes. This insight was deemed critical, as a key part of scaling up is knowing in advance how to structure a program that can withstand a level of scrutiny and diligence by auditors. The company therefore undertook an internal audit that included examining whether or not they had appropriate segregation of duties, a highly-available infrastructure, a BCP plan – as well as how they performed detection monitoring and management of production automation. Ascension developed appropriate communication, adoption and change management – and literally changed the way it built automation to provide insight for management into the production of the work that they were accountable for. Other measures involved moving an isolated development team into the business and integrating the delivery team into process design. A good measure of this success is there’s been no staff attrition throughout the whole journey. The Blue Prism Café is a an engaging, thought provoking, webinar series on Intelligent Automation and the Future of Work, hosted every 2nd Tuesday of the month at 8:00 am PT/11am ET/ 4:00 pm UK. For past recordings and upcoming Cafés, please visit this page.